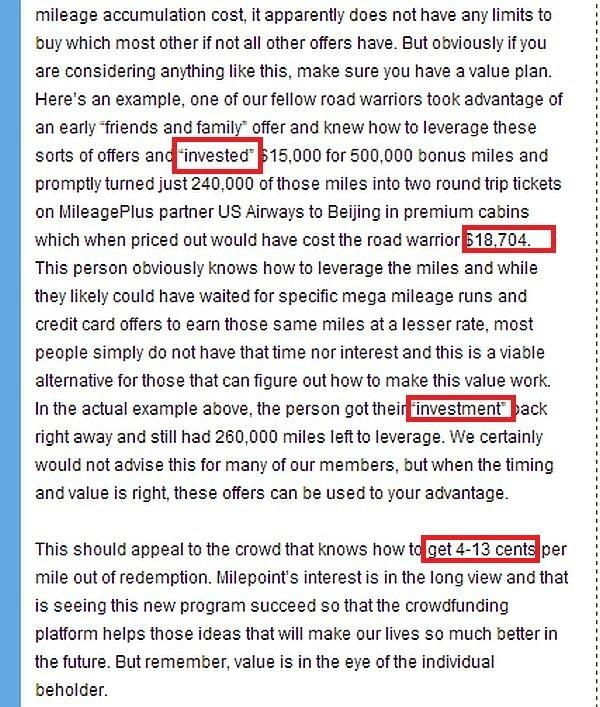 Yesterday, I received email spam from MilePoint about an ability to “invest” to Wall&Main and to essentially buy United MileagePlus miles at around 3 cents each. 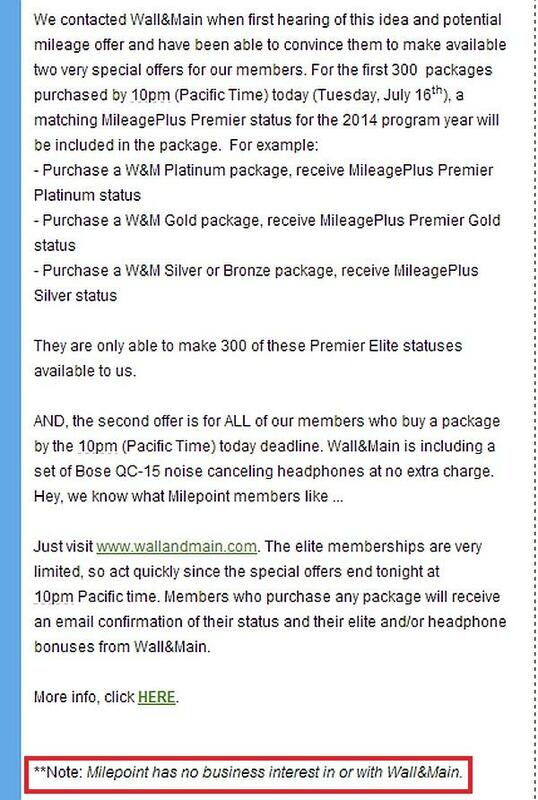 You could purchase a $30K package and get 1 million miles & Platinum Premier status. Wall&Main would also throw in Bose Quiet Comfort headphones. Note that you would not own any equity of this Wall&Main, but would essentially just get the miles and the United status and that’s about it. Doesn’t this sound like a hard sell to you? They have only made 300 of these available and you practically need to make the decision the same day within few hours. The mileage valuation that they have on the marketing piece is also way off. You can theoretically get “value” of 14 cents if you price segment by segment and base the “valuation” on IATA YY F fares. Why any company that is trying to fund themselves, throws basically 50% to 70% of the money coming in as premiums to “funders” and you get zero equity on a company that purpose appears to be making money at the end? The fact that they have the founder of both FlyerTalk and MilePoint endorsing such a “good” deal, doesn’t make it one. Sorry, but this “deal” just sounds terrible and is nothing more than badly worded marketing spam from MilePoint that claims to have “no business interest in or with Wall&Main”. That doesn’t mean that parties associated with MilePoint “family” wouldn’t have any interest in Wall&Main. Why would they otherwise email desperate sounding crap like this to their members? Previous articleWhine Wednesdays: Do Not Disturb? Next articleGOL Goes To Court For Unannounced Smiles Award Chart Changes?